The update sees players train Springfield’s citizens for a space mission. EA Mobile has released the latest content update in The Simpsons: Tapped Out on mobile. 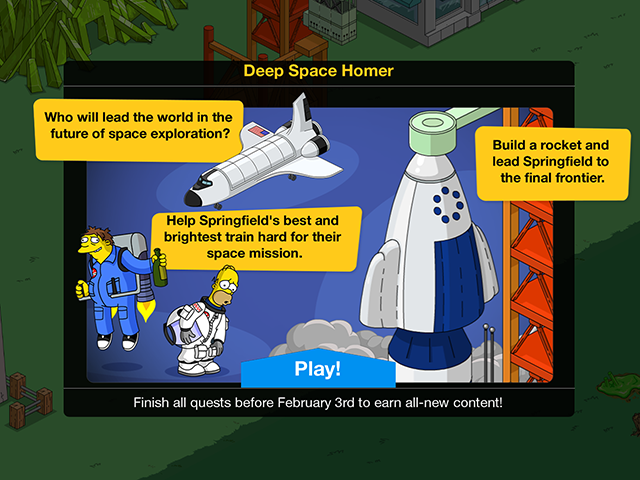 Called ‘Deep Space Homer,’ the update sees players train Springfield’s citizens for a space mission. When they first begin this event, players are given a free Rocket Launch Pad to place in their town. As players complete new event quests, they’ll receive additional rewards, like a Space Training Center and new animations for Homer, as examples. In addition to completing event quests, players are asked to collect NARA Certification Stars by sending characters on special jobs. If players have unlocked Barney in their town (a premium character), he can collect these stars faster than normal characters. This event also gives Barney the new Astronaut Barney outfit. Finally, players can purchase additional space-themed items in the game’s store. A Space Shuttle Simulator, for instance, is available for 75 Donuts, the game’s premium currency. This item produces additional NARA Certification Stars over time. Many of these themed objects will only be available for a limited time. The Simpsons: Tapped Out is available to download for free on the iTunes App Store, Google Play and the Amazon Appstore. Players have until February 3 to complete the quests in this event, and will receive ‘all-new content’ if they finish the quests in time.